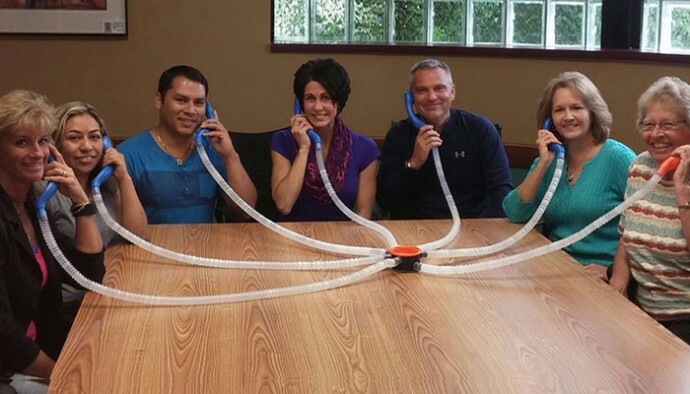 Steve Swain (third from right) demonstrates The WhisperPhone Select with the Leadership and Operations team from Harebrain and RISE Incorporated. Manufacturing expert Steve Swain spends time listening closely to educators. As president of Harebrain Inc., his goal is to identify challenges that help spark development of new and innovative products, and then take them to market. The WhisperPhone line of acoustical voice-feedback devices is among them. These sleek tools help kids learn to read. Today, WhisperPhones are made in the USA and shipped all over the world. We recently asked Steve about the growth of the company, what’s next for Harebrain Inc., and the best ways to sell WhisperPhones. Here’s what he told us. Ed Dealer: The Internet is full of “how to make handheld voice-feedback devices.” Does that bother you? Steve Swain: It doesn’t bother us in the least. Our view is that these sites serve to further communicate to the teaching community and to parents that there is tremendous educational value in providing tools that deliver enhanced auditory feedback. We designed our products to not only effectively capture and convey the learner’s voice, but to also be light to the touch, fun to use, and ergonomically sensitive to the human form. The WhisperPhone is unique – it can connect two students together for paired reading, and connect teachers with up to six students during group literacy instruction. The educational outcome the DIY products attempt to address is the same, but most DIY product components were designed for the disposal of water. Who came up with the WhisperPhones’ cool design and colors? Everything we design is done so in conversations with kids and customers. Our customers inspire us. Teachers and parents tell us they love our elegant design, the way the WhisperPhone connects learners and teachers together, and the way it changes people’s lives. Does it help to develop other skills, in addition to reading? WhisperPhone helps the learning process any time learners benefit from speaking their work aloud. Teachers use our products to help their students take vocabulary tests, check their math facts, edit their writing, practice speech or learn a new language. Do you sell WhisperPhones in other markets, in addition to education? We also have customers who are speech/language pathologists, audiologists, music teachers, and foreign language teachers. At what trade shows do you exhibit? We just returned from The International Literacy Association where we had an opportunity to show teachers our two newest products: WhisperPhone Select (see page 70) and the Element VarietyPak – 12 WhisperPhones available in fun new colors. 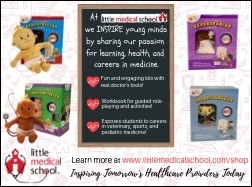 We also exhibit at the trade shows of the American Speech and Hearing Association, Title One, Council for Exceptional Children and NAEYC, plus ED Expo, ECRM and a few smaller shows. We’d love recommendations from your readers where else we should be! You’re based in Minnesota. Is that where WhisperPhones are made? Yes. All of our products are proudly produced in the USA. Also, the company has been built on partnerships like the one we have with Rise Incorporated, a firm that provides employment opportunities for people with disabilities. Rise works to unlock potential and open doors for people with disabilities and other challenges, and seeks to provide them with the opportunity to live a life filled with purpose. We have collaborated closely with Rise from day one and we are proud to call them partners. We are currently developing more products and would welcome (and happily pay for) additional new ideas from our customers and business partners. Also, we are creating a whiteboard video (produced by the same son who started it all!) that lays out why our products help and how they work. Finally, we are quietly, until now, in acquisition mode – seeking to purchase a product company in the education space. Do you have any tips for retailers selling the WhisperPhone in their store or catalog? Our products are demonstration products. For retailers, we have a starter set in new retail packaging that sets up the “auditory learning” section of your catalog, website or store. It includes product to be used for demonstration. Retail staff training is very important – viewing our new video will help with the first step of that training. We find that when store employees understand the full product line of the Solo WhisperPhones and the upsell of the Duet and Select WhisperPhones, there is a great deal of purchase order opportunity! For those stores that publish their own custom catalog, we have resources to help with product suggestions, text, images and supporting video marketing. Our new video is a MUST LINK for every website and catalog customer! For more information about WhisperPhone, email steve@whisperphone.com.